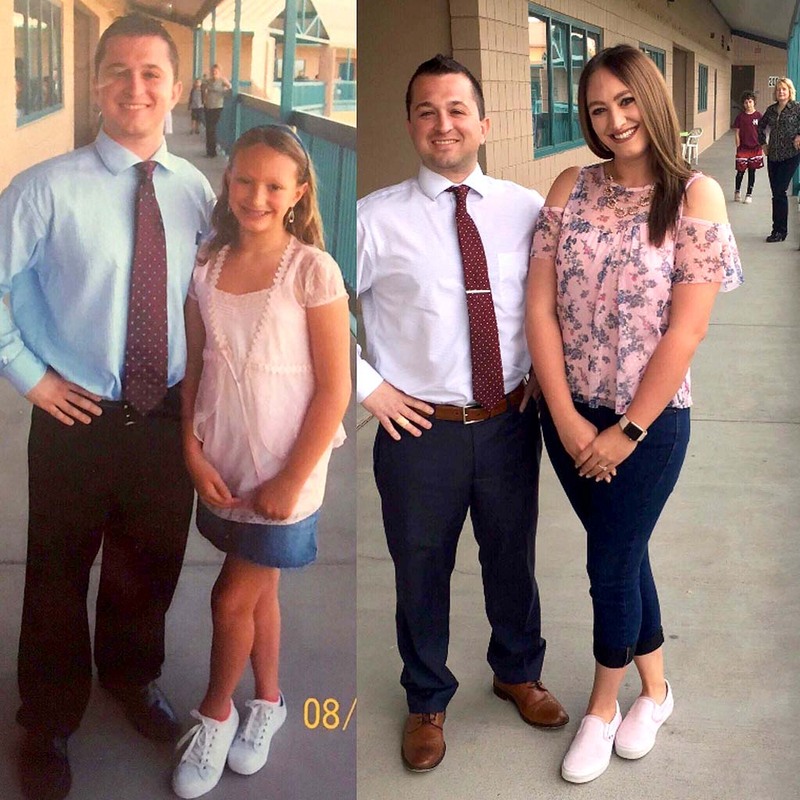 Aaron Pettinato, Interim-Principal at Horseshoe Trails Elementary School and first year teacher –Briana Reese, first grade teacher, have a history. Aaron started his first teaching job at HTES in 2006. Briana started Kindergarten at Desert Willow, transferred to Horseshoe Trails in 4th grade, attended Sonoran Trails Middle School and graduated from Cactus Shadows in 2014. Briana was in 5th grade when this picture was taken at HTES with then, first-year teacher Aaron Pettinato. Fast forward to 2019 – Aaron was named Interim-Principal of Horseshoe Trails for the remainder of the 2018-19 school year and Principal for the 2019-2020 school year. Briana is in her first year of teaching at HTES this year. Check out the side by side picture of them then and now. They even called in retired teacher, Carmen Sterner, to stand in the background for the recreation! Horseshoe Trails Elementary School offers students a Chinese Immersion Program beginning in Kindergarten; On-Site Horsemanship and Equestrian Program; and Chinese Taught PreK-6. Contact Mr. Aaron Pettinato, Interim-Principal at apettinato@ccusd93.orgor by calling 480-272-8500.